The finalists listen to Palestinian primary school teacher Hanan al-Hroub speak after she won the second annual Global Teacher Prize, in Dubai, United Arab Emirates, Sunday, March 13, 2016. Al-Hroub who encourages students to renounce violence won a $1 million prize for teaching excellence. A Palestinian teacher has won an international teaching prize, earning her $1 million dollars. 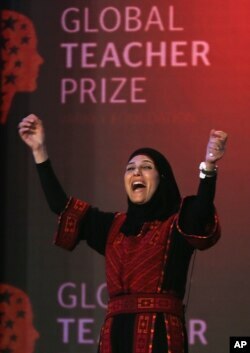 Hanan Al-Hroub, a teacher from the West Bank, won the Global Teacher Prize on Sunday. Pope Francis announced the award in a video. He talked about the importance of education and teachers, especially for children who have seen violence. Pope Francis said teachers were "the builders of peace and unity." At the award ceremony in Dubai, Al-Hroub told the audience that "teachers could change the world." Al-Hroub, who grew up in a refugee camp, is a specialist in helping children who have witnessed violence. She teaches at an elementary school in Al-Bireh, near Ramallah in the West Bank. Al-Hroub says she became interested in teaching when her children saw a shooting on their way home from school. Helping her children recover from that experience made her think about how classrooms can help other children. Al-Hroub was among 10 finalists. The nine other finalists came from the United States, Pakistan, Kenya, Japan, India, Finland, Australia and Britain. Al-Hroub had the other finalists stand on stage with her after her speech. Given to one teacher every year, the Global Teacher Prize is an award that recognizes a teacher who has made a contribution to the teaching profession. The teacher must use new classroom practices and encourage others to become teachers. The Varkey Foundation gives the award. Its founder, Sunny Varkey, established the GEMS Education company, which has more than 80 schools around the world. Sunny Varkey said he hoped that Hanan Al-Hroub's story would "inspire those looking to enter the teaching profession." This story uses information from the BBC, Washington Post and Associated Press. John Russell adapted this story for Learning English. Kathleen Struck was the editor. What do you think makes a great teacher? Write to us in the Comments section below and on our Facebook page.